Lagom is about living in moderation. Lagom is when work, stress and happiness are all in balance and things don’t have to be perfect. Lagom is about being satisfied with what you have, making the most of what you have, and finding the middle road between too much and too little and following it. 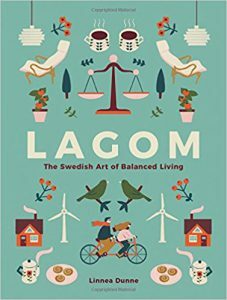 How does Lagom differ from Hygge? Simply put, Lagom is a lifestyle choice, and Hygge is a feeling or awareness of a feeling. The Danish concept of Hygge is taking notice of the little, simple things in life and enjoying the contentment that comes from them. Hygge is enjoying the aroma of your coffee, the next chapter in a good book, or the tingle you get from a gorgeous sunset. Learn more about Hygge in, What is Hygge? Everything You Need to Know About the Danish Lifestyle Trend, featured in Country Living. How Can I Incorporate Lagom in My Life? According to Susie Faux who coined the phrase, the concept of a capsule wardrobe is to select a smaller wardrobe that consists of a few essential and timeless items that can be supplemented with seasonal pieces. Think of the time this frees up worrying about what to wear not to mention saving money and space in your closet! For more on the capsule wardrobe, Nicole Anzia wrote this informative piece on the capsule wardrobe for The Washington Post. What’s at the center of the Lagom concept? You are. A daily coffee break to refresh helps to manage stress and contributes to being more productive when you resume your work. Use multi-purpose furniture in your home. Ok, you knew we were waiting for this one. Solid wood furniture will last generations, making it supportive of the sustainable side of the Lagom concept. And furniture that serves more than one purpose? Well, when you go with custom furniture, that’s a given! 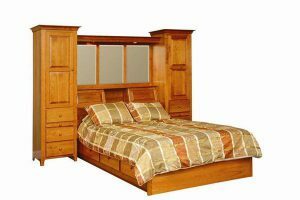 Offering storage, bookshelves and a place to rest, the Amish Scarbough Bookcase Bed multitasks for a Lagom bedroom. 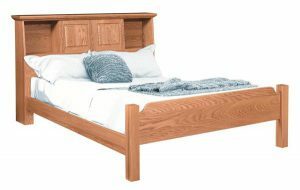 It’s easy to declutter with the storage provided by The Amish Shaker Pier Platform Bed. 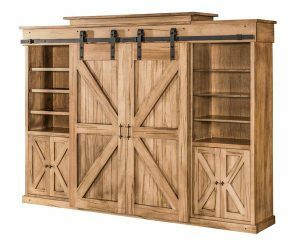 Support lagom in the living room with the Amish Teton Smaller Wall Unit. 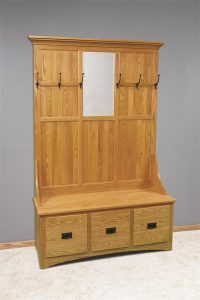 An Amish Pine One Door Hutch adds organization to any room. And for entryway, the Mission Hall Tree Storage Bench gets things in order. We can’t resist mentioning Unwined Candles for a Lagom household. These are perfect for enjoying the moment right where you are in the world. Plus they’re made from recycled wine bottles and natural soy wax. The Unwined Candle Collection includes scents like 5 O’Clock Somewhere, Gingerbread Lane, Let It Be, Pumpkin Pie, Vanilla Bean, Farmer’s Market and Sweet Sandalwood. The eco-friendly Unwined Candle Collection available at DutchCrafters. Additional suggestions for lagom living include the use of LED lights that are more energy efficient, re-usable food storage containers instead of disposable plastic bags, and growing your own herb garden that’s fresh, free of packaging and costs you less.